9/11, 7/7 & the War on Freedom :: View topic - Fake plane crash - 'proof' of No Planes? Fake plane crash - 'proof' of No Planes? Posted: Wed Sep 17, 2008 4:03 pm Post subject: Fake plane crash - 'proof' of No Planes? CB_Brookfake has just sent me his latest incredible analysis, which has already been posted on 3746 internet forums and is mirrored on the websites of Dr Judy Johnson, Andrew Wood and the flat earth society. A small plane sliced into a skyscraper today in the heart of Milan, killing at least 3 people, injuring about 60 and frightening Italians with its reminder of Sept. 11. But the government said the crash appeared to be an accident that occurred after the pilot, the only person on board, reported problems with his landing gear. The scene did indeed eerily mirror the attack on the World Trade Center, with television images of smoke billowing out of the top of a glass-and-steel monolith, and bloodied, dazed workers staggering on glass-carpeted streets as others ran. But in this case, firefighters were able to race up stairways and complete their rescues of people inside, and many people were able to leave safely on their own. A practice evacuation session had been held a month ago. The plane, a four-seat Rockwell Commander 112, had taken off from Locarno, Switzerland, for a 20-minute flight to Linate Airport just outside Milan, Italy's commercial center. The pilot reported trouble lowering the plane's wheels, the police said. 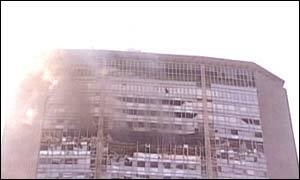 Then, shortly before 6 p.m., the craft punched into the 25th and 26th floors of the building -- a wide, flat, 30-story skyscraper affectionately called Il Pirellone, or the Big Pirelli, after the tire company that used to have its headquarters there. The building is now owned by the Province of Lombardy and houses local government offices. Built in the late 1950's, it is by far Milan's tallest structure. It stands several hundred yards from the central train station, which along with the Milan Stock Exchange was closed after the crash as a precaution. About eight stories were damaged in the top center of the building, giving the impression of a punch to the forehead. A Milan fire department official at the scene, Tommaso De Lena, said that despite the damage, the resulting fire was not intense and there was no danger of building failure. Mr. De Lena said at least three people had been killed -- two severely burned inside the building and the third on the ground. He said he could not confirm reports that a victim on the ground had leapt from the building. The interior minister, Claudio Scajola, said, ''Initial reports point to an accident.'' A Milan police inspector, who spoke on condition of anonymity, said that although an accident was ''90 percent likely,'' the police were awaiting results of an investigation. It was not clear why a landing-gear problem would have caused the pilot, identified as Luigi Fasulo, 67, of Switzerland, to crash the plane into the building. Despite the proximity of Linate Airport to the city center, the area over the building is off limits to all flights, the police inspector said. Some witnesses told Italian state television that they saw the plane burning before it hit the building. It was not clear how many people were in the building at the time. About 1,300 people work there, but many had left for the day. In Rome and other Italian cities, workers often take a long midday break and stay until 8 p.m.
President Bush was immediately told of the event, said Ari Fleischer, the White House spokesman, who also said F.B.I. agents were assigned to help investigate. Italy has been on higher alert since Sept. 11, initially because of threats to the American Embassy in Rome. This week, security was reinforced because of a nationwide strike, which took place Wednesday, and the departure of the exiled king of Afghanistan today. The comparison to Sept. 11 was inescapable. Italian reporters passing as the plane struck took out their cellphones and immediately began calling in reports that were broadcast on television and radio. A taxi driver, Stefano Brando, said it appeared that everyone he saw had heard about the accident within 10 minutes. Some may have been extra fearful because the president of the Italian Senate, Marcello Pera, at first spoke of a terrorist attack, though his spokesman soon amended his remarks. ''But this is happening right here in Milan?'' moaned a woman watching the billowing smoke. There were heroic stories. One of them involved a 10-member squad from the region's elite rescue unit, which specializes in cave, river, mountain and high-rise rescues. They learned of a woman trapped in the elevator on the 15th floor and rushed into the building. The force of the impact had dislodged the elevator doors, preventing the elevator from moving, and the doors could not be opened. The nearest door with access to the elevator, an express, was on the 24th floor, luckily one flight below where the plane hit. The men of the unit ran up the stairs. They lowered three ropes, one a safety line, another for the person in the elevator and a third for Firefighter Mauro Bonfanti, who rappelled his way down nine floors to the roof of the elevator. He had to clear away debris from the top to get at the emergency door, and then dropped into the cabin. There, he put a harness on the woman, who was said to be in her mid-20's. At the top, Firefighter Riccardo Munaretti helped raise her up. But all during the exhausting haul up the 24 flights, Mr. Munaretti said, another disaster was on his mind. ''When we were running up the stairs, we were thinking about what happened on Sept. 11,'' he said. how much of a planehugging sheeple do you have to be to buy into this lenin-inspired propaganda fairytale? and it's clear from the start that "DANIEL J. WAKIN" is fully involved in the massive consipracy to fool the world into thinking that this fake event actually happened - possibly as a mind-control victim of the evil shape shifting zionazi lizard perps who control the media. "A small plane sliced into a skyscraper today"
wait a minute....does anybody see a problem here? could a tiny, flimsy one engined plane really slice into a building? as any gullible, ignorant sockpuppet of killtown will tell you - if you look up Newton's laws of motion on the internet and pretend to understand them, you can conclusively prove that this would break the laws of physics. THEREFORE IT MUST BE FAKE!!!!! "I had a feeling it was like a movie"
why did she have a feeling it was like a movie? "Italian reporters passing as the plane struck took out their cellphones and immediately began calling in reports that were broadcast on television and radio." is it just a coincidence that these so-called eyewitnesses worked for the media? and what do all these so-called witness statements have in common? 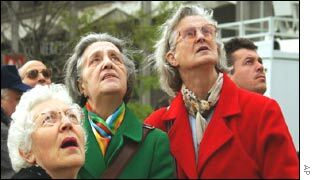 NONE OF THEM SAW A PLANE!!!!! and could a small plane really do this much damage to a huge building? or were directed energy weapons involved? by the way - did you notice how the colour of the sky has also been changed when you compare this second picture with the first one above? do these "people" look like real witnesses to you? notice the obvious fakery in the above image - the guy's head on the right has clearly been photoshopped in. 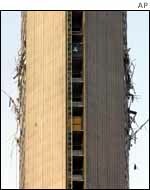 and can you see any evidence of a plane in this photo of the gutted 25th and 26th floor offices? or is this damage clearly the result of secret exotic technologies? and could it all have something to do with this? Wow, thanks Gruts, I see it now! 9/11 didn't happen. It was just tv fakery. Your post proves it. AND GET THIS!!! Berlusconi, who was Italy's Prime Minister at the time, founded and owns...wait for it....Mediaset ! Italy's largest commercial television network....whose HQ are in....Milan...!!! The very same place of the plane crash which was obviously faked by the evil-perps and broadcast on the Berlusconi controlled network. Notice how the old women in the photo are looking one way and the man to the right of the pic is looking another way. Clearly this is total proof that the plane was faked and I do not need from this moment forth to examine any evidence which contradicts my opinion because you, Gruts, god of all the Milan fake-plane story knowledge has shown me the light and anyone who questions you is a mass-murderer protecting shill. I can't wait for the youtube mash-up. Actually, that mad guy on the youtube had a lot going for him. Never mind for a minute the Christian stuff. The Sun informed us a few days ago that the Hedron Collider doesn't work up to full operation for another four years - 2012 - now isn't that a coincidence. Oh ho ho ho HO HO HO gruts, this is H-U-G-E! Almost as colossal as my ego! And as a sidenote, on a marketing level, I'd quickly suggest a bit more baby talk for increased credibility with the target audience. We know toastie-woastie cars, fuzzy-wuzzy balls and beamy-weamy-diddly-poo-bops are a big hit and already patented, but a little effort now in this area at this stage could mean all the difference later between being read by two or three people in an ST911 paper, or reaching perhaps up to ten times that on a Dynamic Duo show. Or it could be those big coloured letters that do it. yourself think when somebody's shouting near you. While I can't fault your research, I feel that you've missed that it's all too predictable that with previous 4-sided and 5-sided "plane" targets, it was only a matter of time before a 3-sided building was picked on. Although it's readily apparent that only buildings with even numbered sides are totally destroyed. This seems to be a consistent design flaw with exotic weaponry. Maybe the square roots confuse it. Obviously my weapon analysis numerological kinetic hypothesis (or for convenience - W.A.N.K.Hy.) theory still needs a fair bit of work, but until then you won't see me anywhere near anything Bucky Fuller's had a hand in designing. Posted: Thu Sep 18, 2008 12:50 am Post subject: Re: Fake plane crash - 'proof' of No Planes? * Understand the definition of critical thinking and the importance of the definition terms "systematic," "evaluation," "formulation," and "rational standards." * Understand how critical thinking relates to logic, the truth or falsity of statements, knowledge, and personal empowerment. * Appreciate why critical thinking is better than the passive acceptance of beliefs. Do these OAP people look like real witnesses to you? Is the face on the right "photoshopped" in? How do you come to your conclusion by your belief, or by critical thinking? big coloured letters is definitely the way to go if you want to be taken seriously as a researcher. and a conspiracy as big as this one also demands the gratuitous use of CAPITALISATION, some bold font and plenty of EXCLAMATION MARKS!!!!! Whilst I like to keep an open mind, "General" is not the place to post 'proof' of theories such as yours. Even if your theories were true (which plainly they aren't), the general public (and this is the point) are turned off by such unbelievable stories. Sadly, many of the public (including yourself IMHO) are gullible and it is difficult enough to get the important points across about 9/11 as it is. a slight shift in gruts' grasp on what is sometimes referred to as 'the real world' over the past year, as study of his previous posts will show. While 'no planes' is still not exactly within what you'd call hailing distance of our 'reality', take my word that it's a giant leap for mankind compared to this time last year when you couldn't move around here except to bump into another Giant Holographic Banana thread. 'How Not To Fake A Banana' and '250 Non-Smoking Bananas', the latter inexplicably picking up a coveted Bogart Award from ASH. It remains to be seen what good will come of any of it. Btw - you're not a perp, are you? 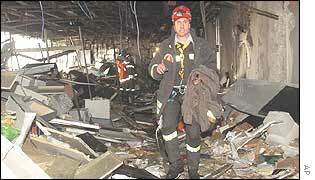 the purpose of my post was to take a genuine news story about a plane crashing into a large building - that as far as I know nobody has disputed - and deny it happened using the same kind of reality-defying stupidity which is routinely employed by no-planers about the planes that crashed into the wtc. Don't worry the fakery crowd will certainly not waste their time with this. This calls into question the entire basis of their cult. a)a plane "slicing" into a building. b)little evidence of the plane in pictures. c)eyewitnesses didn't see a plane. d)media employees called media centres as 'live' eyewitnesses. e)anomalies within photos of eyewitnesses. Wait...don't tell me....this was set up to make it look like the same things could happen when no tv fakery was used to lead people away from the unquestionable use of tv fakery on 9/11...excuse me while I polish my Champion Tin-foil hat. Because it may force you to realise that what many consider to be 'proof' of tv fakery can actually happen in exactly the same way elsewhere when tv fakery is not 'necessary', 'desired' or even asserted as being evident?. Because you might have to question your cultic position on the matter? No, because you're right and that's that. Although I'm not sure if TJ was outspoofing the ongoing spoofery, there's plenty more NPT-ery that's desperately in need of having the pyss mercilessly extracted. Satirising this sheeit has a place alongside reasoned analysis. As a tireless crusader against the freemasonic tentacles of zion which enslave every aspect of our lives - in association with the jesuits, the annunaki and the voices in my head - I demand to know the name of the shill who was responsible for editing the title of this thread! such a blatant attempt to surpress the real truth is just further evidence that this half-truth forum is being run by the perps!!! and please ban chek from posting on my threads. anyone who doesn't believe in the existence of secret MIHB technology is a total shill!!!!! I've just noticed that the 'real' plane crash occurred on April 19th...? Another of Their favourite dates. Waco and the OKC bombing. This would cause one to suspect this story. If one was that way inclined of course. But now that you've mentioned it I'm SURE there must be a connection!!!!! 2002 is 9 years after 1993 (waco) and 7 years after 1995 (okc) and april is the 4th month of the year! 7 plus 4 = 11.
so there you have it - 9/11!!!! Thank you Lee for finding yet another smoking gun that is clearly part of this devilish psyop!!!!! Why isn't Judy Wood talking about this? Why does Webfairy totally avoid the Pirelli Tower evidence? Why the deafening silence from Simon Shack? Why isn't Killtown blogging about it? could they be SHILLS by any chance? I am saying that you are using your beliefs rather than true critical thinking. You are not showing us the truth because you don't how to think for yourself, or even to be honest with yourself. Instead, what you see is filtered by what your beliefs say, which everyone else can see is a load of nonsense. I'm very perceptive in some ways but not in others and I'm not sure what you are getting at, Chek. I think that people should say what they mean but looking at your first post, it strongly suggests that you believe that NPT is true. If I misunderstood your tongue in cheek humour, please forgive me for taking what you said on face value. TJ, think of it as a humourous thread making some serious points. (Although if you're not familiar with the M.O. of some of the prime movers and personalities in the NPT/TVF field, many of the references may have gone unrecognised by you). It does make some good points and I apologise to Gruts and you for getting the context wrong. I often have memory problems but I should have known better. no worries mate - I'll take it as a compliment that you considered my imitation of a typical no-planer to be so authentic! Posted: Sat Sep 20, 2008 11:40 pm Post subject: Why so afraid? use reason and evidence, not herd-tactics and ridicule. Posted: Sun Sep 21, 2008 12:54 am Post subject: Re: Why so afraid? Yes, perhaps you'd like to pass that on to the fakery crowd....? Especially the reason and evidence bit. Posted: Sun Sep 21, 2008 10:19 am Post subject: Re: Why so afraid? the case for npt/tv fakery has been completely destroyed with evidence, logic and reason many times over - the debates have been won and the promoters of this drivel have been shown up repeatedly as liars, frauds and incompetents (or sheep-like repeaters) - been there, done that, got the t-shirt. sadly, noplaners seem to have an infinite capacity to avoid the truth about the drivel that they're peddling and just keep on repeating it regardless. and as much of what they say is frankly laughable - a bit of piss taking is perfectly in order. do you have anything to say on the subject that isn't a complete joke and hasn't already been shown to be garbage? Posted: Sun Sep 21, 2008 7:01 pm Post subject: Which bits have been shown up as garbage? Posted: Sun Sep 21, 2008 7:03 pm Post subject: Which bits have been shown up as garbage? Why can't you put it in here? ?